Quality food, the fish seem to like it and it doesn't pollute the water s far as I can see. 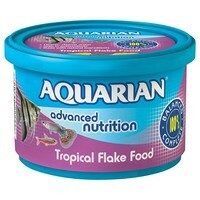 I stick with Aquarian for the tropical fish, goldfish and holiday feeders. This is a excellent product the water in the tank remains clear and the fish love the food. I cannot recommend it highly enough.